Okay, I couldn’t resist this sharing the following with all of our faithful readers who are constantly struggling to squeeze a few more yards from their drivers. 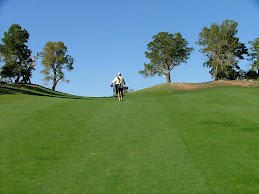 There is apparently a great dilemma: Do I try to achieve greater distance or do I want to find my ball? I’m kind of wondering if Billy from Michigan has any fun playing the game while he’s worrying about swing speed, launch angle and a few extra yards when he already hits it pretty straight. Frank does a pretty good job of catering to Billy with the technical jargon and then tries to calm him down with a good dose of reality. I need help! My swing speed is around 125 mph with the driver (460 Adams xstiff), yet I have never hit a drive over 310 yards. Most of the time when I hit it good off the tee I’m around 285 (bone-straight 12-degree launch). How is this possible? I play about 150 rounds a year, so I know I’m not missing the sweet spot every single time. I read somewhere that you should get 3 yards for every mph your club head is traveling. If this is true, what is stopping my drive from traveling 350? Thanks for any info, Frank. Hope all is well. If I were you, I would settle for the drives you have and concentrate on the rest of your game, as there is nothing wrong with what you’re getting from your driver, especially since you’re hitting it both long and straight. Then the next step is to apply for your PGA TOUR card if you don’t already have it.